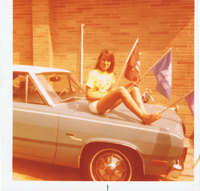 That's me, age 13, on my mother's new car, a 1972 Plymouth Scamp. (She just about had a bird when the photos came back from the drugstore.) I learned to drive on that car when I was 17, and not long afterwards, it became the first car I owned. Less than a year after I learned to drive, believe it or not, the city of Toronto gave me a taxi driver's license. I was thinking about that Plymouth the other day, and the cabs I drove in the late 1970s and early 1980s, when I was assessing a brand-new car and marking against it because it had very few storage cubbies. How times have changed. My Plymouth had a glovebox and an ashtray, and that was it. With the cabs, we'd sometimes buy plastic consoles that sat on the transmission hump. They could be a pain if someone wanted to sit in the middle, though, because most cars had front bench seats. Cars didn't have cupholders back then, save for the inside of my glovebox's metal lid, which had a couple of indentations to hold a mug if you stopped at A&W for a root beer. I don't remember people drinking anything when they actually drove. We did in the taxis, because there wasn't time to stop. Coffee shops used styrofoam cups, not paper, and we'd wedge them between the dash and the windshield. Some guys bought cupholders that hung off the windowframe, but they were more trouble than they were worth. We'd put a lid on the cup and then tear out a hole so we could drink on the go, and sometimes passengers would marvel at such a great idea. Now the lids come with the holes already scored. Cars didn't have door pockets. They didn't have a mirror on the passenger door, but they did have vinyl roofs that were definitely not the stylist's finer moment. If you ordered a rear defogger, it was a fan in the parcel shelf that blew warm air on the window, very noisily. I thought I'd died and gone to heaven the day I got a taxi that had air conditioning, power windows and power locks. It was like driving a Cadillac. And those were back in the days when the only thing better than a Cadillac was a Rolls Royce. Good heavens, I feel old.